We recently completed another film with artist duo Broomberg & Chanarin which will be exhibited at King’s Cross station. 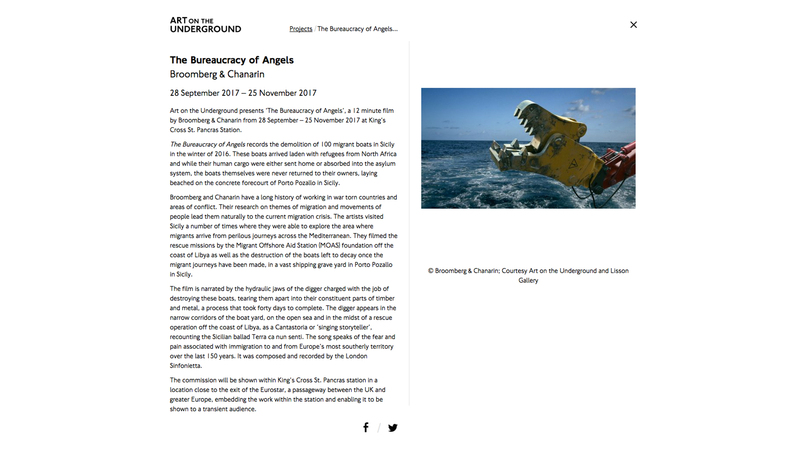 For ‘The Bureaucracy of Angels’ Broomberg & Chanarin embedded themselves with the Migrant Offshore Aid Station (MOAS) foundation off the coast of Libya, filming rescues of migrants making the crossing to Italy. They also travelled to the vast shipping grave yard in Porto Pozallo in Sicily to document the destruction of these wrecked migrant boats. The film is narrated by the hydraulic jaws of the digger charged with the job of destroying these boats. The digger appears in the narrow corridors of the boat yard, on the open sea and in the midst of a rescue operation off the coast of Libya, as a Cantastoria or ‘singing storyteller’, recounting the Sicilian ballad Terra ca nun senti. The song speaks of the fear and pain associated with immigration to and from Europe’s most southerly territory over the last 150 years.